The almighty Intel’s 9th generation processor Core i9 9900K has finally impinged upon the market with its sheer prowess of 8 Cores and unprecedented clock speeds which easily eclipse its competitor, Ryzen 2700X. With significant improvements over its predecessor 8900K such as stable 5GHz clock speeds over all cores and the soldered IHS to the dye which accords a superior temperature control sustaining at 80-degree Celsius even at overclocked speeds! Now, the million dollar question arises. Which motherboard is truly worthy of pandering all the demands of the strongest processor in the world? All your questions will be answered by our blow-by-blow list of 5 best motherboards you must add in your shortlist for your dream system. One cannot simply overstate the firm hold of ASUS on the market when it comes to motherboards. 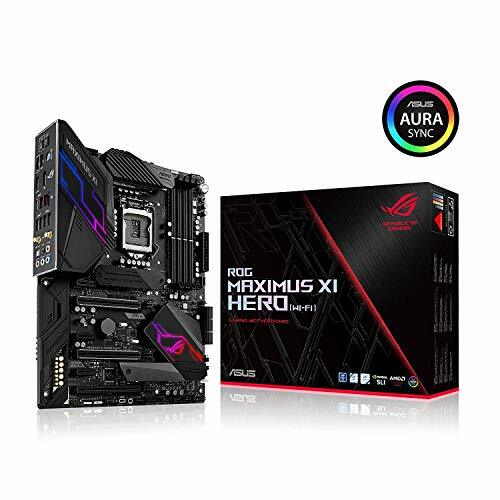 This time they are set out to ignite their flamboyant spark in the Z390 chipset range with their ASUS ROG MAXIMUS Hero 11, the name alone makes you want to get a piece this bad boy. It comes with three PCIe slots and dual M.2. Point of import here is that one of the M.2 drive screws comes over-tightened from the ASUS’ assembly line, so, make sure to loosen them carefully with proper screwing tools beforehand. Make sure to ground yourself while handling the board as it doesn’t come with an anti-static bag. Now let’s get to the critical aspect, the VRM. It has a magnificent 4 phase design using Vishay Silicon X Si dual stage MOSFETs. It showed a glaring performance at overclocked speeds by expending less power and drawing remarkable water and air overclock speeds. 8 pin + 4 pins for adequate supply, this is lesser in contrast to MSI MEG (Number 4th in our list) which has two 8 pin power connectors. Moreover, it has a clear CMOS button and dual BIOS button respectively. Impressively, the thermal finesse of VRM allowed it to sustain 50 degrees Celcius at overclocked speeds with great power efficiencies. It features DDR4 memory clocks supporting up to 44ooMHz. Now let’s talk about its audio and cooling systems. It employs supreme FX audio solution which displayed amazing test results rooting from observations of frequency response curves. Proper noise suppression of the mics will play a substantive role for gamers, assisting them in hearing the voices of teammates with clarity. Of note, if you’re getting the mobo for audio, make sure to keep the volume below 90 in the settings. It has 8 PMW fan headers which are easily configurable via Fan Xpert 4 or the UEFI BIOS. Each header can be set to monitor and react to three user-configurable thermal sensors, for workload based cooling. Speaking of BIOS, ASUS has all the wanted features for overclocking, LLC levels, a well pre-set overclocks for memory and overclocking to 5GHz or higher. Of course, it has also implemented a power button and a Dr. Debug LED light for LN2 overclockers. On top of these, all the ASUS-only features like Optimem 2 and Supreme FX only goes on to fuel the excellence of this board. With all the heating up competition, GIGABYTE jumps into the fray as well. For the past few chipset generations, GIGABYTE seemed to be falling behind in the race for the best motherboards mainly due to their basic BIOS which was bodied by other manufacturers. This time around they took up arms to turn the tables around with their AORUS Z390 series with their emboldening VRM design of 12 plus phases. 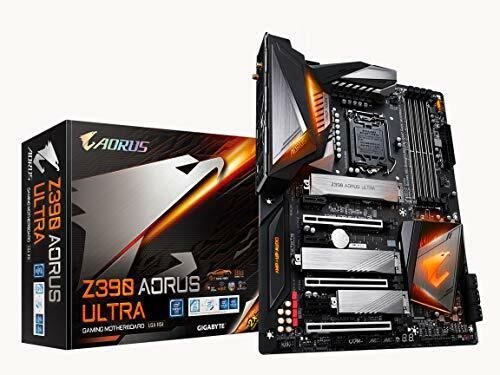 For this list, we chose the middle-of-the-road and most balanced board out of the series, Z390 AORUS Ultra. It provides fins for its VRM heatsink, and is the only board to do that, and provides actual thermal contact between the board and the backplate with thermal pads, has a high quality VRM, 12 phase, 6 with doublers, and includes all the features of all the other boards, while in actual real-world testing showing the best thermals, with a normal price-tag for the quality of the motherboard. So, have GIGABYTE caught up? That would be a strong yes. Triple ultra-fast NVMe PCIe Gen3 x4 M.2 with triple thermal guards are further enhancing the experience like never before. Also getting 2 Mb/s more on WiFi download speeds with 50 Mb/s connection speed by using the onboard antenna. It uses a digital CPU power design which includes both digital PWM Controller and DrMOS. These 100% digital controller and additional 8+4 Solid-pin CPU power connectors offer incredible precision in delivering power to the motherboard’s most power-hungry and energy-sensitive components enabling the hungry enthusiasts to such as much power as they need for their 9900K. It provides proper compatibility to DDR4 at 4266MHz. It has a dexterous audio system which aptly detects the impedance of your head-worn audio device and prevents issues such as low volume and distortion. In terms of cooling, it comes with Smart Fan which allows the users to interchange their fan headers to reflect different thermal sensors at different locations on the motherboard and gives users up-to-the-second details on flow rate and temperatures. As far as the BIOS is concerned, Gigabyte’s UEFI BIOS UI. It looks outdated but quality control is great! Yet there is a significant room of improvement for the BIOS to actually be able to go toe-to-toe with BIOS of other boards on this list. Last but not least, the aesthetics have taken a significant u-turn with their new neutral looks with RGB lighting allowing the boar to blend into any type of system with its subtle yet appealing visuals. The bottom line is, if you’re not avidly engaged in the BIOS configuration and have no major issues with the BIOS, then this board has so much more to give you in the form of, arguably, one of the best VRM systems in this list and, to top it off, a heartening investment from a price per performance standpoint. 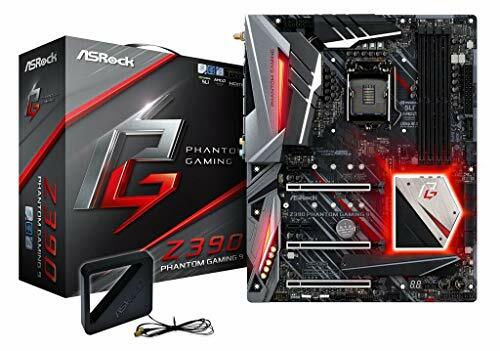 ASRock’s Fatal1ty range of boards are knocked out of the picture by their brand new Phantom Gaming series which has evoked some serious rumblings in the land of motherboards. ASRock has come a long way with their motherboards and this time around they’ve arrived at the scene with their Phantom 9 stationing a constellation of features which really outmatch MSI Godlike (the most expensive in our list) in terms of price to performance ratio. Performance wise and price wise it definitely cannot be looped under “cheap”. It comes with three PCIe slots which support two-way SLI along with additional x1 PCIe slots to place longer graphics cards in them, so, that is a neat feature. It has two M.2 slots which are trimmed up to their NVMe only and does not support SATA, however, there are additional SATA compatible M.2 slots spread under the heat sink. It has a beefy VRM cooling system with 12 phases maintaining VRM temperatures of 67-degrees. The board also features an LED debug and offers a total of 6 (4-pin) fan headers. It is one of the only boards which has three LAN ports of 2.5 Gbps interface instead of conventional 1 Gbps Ethernet LAN switch on other boards at the time of launch among consumer grade boards. We performed various performance test on this board like 3D mark time spy test, 3D mark fire strike, blender, Cinebench R15, handbrake, etc and compared it with other Z390 boards. And it gave out solid results by consistently staying at the top of the stack. The complete feature set for this motherboard such as Realtek ALC1220 audio codec, a ton of USB 3.1 (Gen 1 / Gen 2) ports, dual M.2 ports and one with an M.2 heatsink is all a user would ever need. In a nutshell, ASRock wanted to land a motherboard with high-tier features and a reasonable price point in order to fill the empty slot for “ASRock’s exclusive gaming board”, and their aim has clearly hit the bull’s eye. 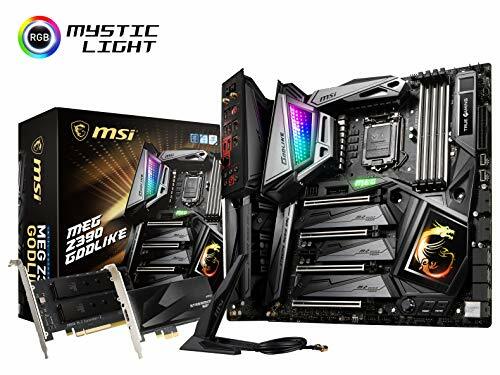 MSI MEG Z390 is the ultimate home for your new 9900K, this behemoth of a motherboard is the highway to the ultimate gaming experience. I mean, you only live once, so, the price should be no object for you when you are chasing your passion! Those enthusiasts who stick to the foregoing motto are advised to give this beast a look. Let’s start with PCIe slots, it has 4 slots. It will remain a mystery as to why MSI didn’t add PLX chips to the board. We’ve got three onboard M.2 (NVMe, SATA and, PCIe supported) with a name, “Shield Frozer”, the secret behind this title is are the newly introduced thermal pads on both sides of M.2. Furthermore, it has a Turbo U.2 SSD slot which truly is “godlike” with their tremendous transfer speeds. This board has a postcode, so that’s a solid plus. It supports two way SLI but you can run 4-way crossfire on this as crossfire is not hindered by the bandwidth. Furthermore, the board has a BIOS switch which means you can enjoy dual BIOS on it, so, if you break one, you still have the other BIOS to unbreak the first. There is a pack of many more useful OC functionalities at the bottom of the board. The brightest spot you’ll notice on the motherboard is its array of 16 phase Vcore VRM, which is beefy enough to keep up with the 9th gen processors. This was crafted really efficiently by MSI to and it boasts the level of performance which can actually be comparable to GPU VRMs, and we all know how the GPU VRMs are much better than motherboard VRMs. Remarkably, it features a fine LN2 system for your extreme overclocking which comes into complete agreement with its VRM. There are four shielded DDR4 supported memory slots stable memory overclocking which will support up to 64 GB and 4600 MHz. Are you not that fond of overclocking? No worries, MSI has provided an overclocking dial/knob for you to adjust different settings in the BIOS enabling you to adjust overclocking speeds/performance levels (Within safe perimeters) without having to go in there manually. When it comes to aesthetics, it looks drop-dead cool with its “mystic light infinity” having 16.8 million colors and 27 effects. You know the drill, connect an RGB or rainbow LED strips with addressable headers to create a kickass RGB gaming PC. Its cooling system isn’t falling behind either, it has 6 fans header, all stationed at the top which is a good thing, which can give access to things like AIO coolers and fans, top and back of the case. Although it is considered an eATX case, it came fit flawlessly into. As an overview, this is a solid investment if you’re aiming at the top of PC hierarchy, go for it and thank us later! 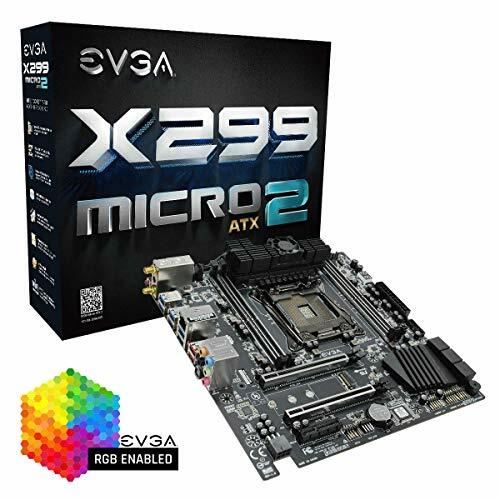 With all the spurring Z390 uproar EVGA announces its Z390 motherboards which are teemed with many innovative features to set them apart from other 300 series boards by offering stunning overclocking capabilities. Compared to its competition, EVGA likes to keep things simple, they are not adding all the fancy features known from Maximus/Godlike/Aorus series, such as RGB lights, preinstalled I/O brackets and so on. It has three reinforced PCIe slots and four reinforced DIMM slots that support up to 64 GB RAM and 4133+ MHz. One glaring feature is their new SPI flash USB ports allowing you to flash motherboard’s BIOS without CPU installed. In this way, you can update the microcode for newer CPUs. Two M.2 ports supporting 2 key Ms, Intel Optane memory and M.2 key for WiFi and Bluetooth. The EVGA FTW rocks a highly efficient digital VRM connected to an 11 phase power design. Moreover, it supports two-way SLI and EVGA’s new GUI BIOS featuring OC Robot and an in-BIOS stress test. It has excellent audio set up with their ALC 1220 HD Audio supporting 7.1 surround sound. They have employed new capacitors for their new audio which are essentially amplifiers which send high impedance through the front panel audio. You can exploit this feature to the fullest with your high-impedance headphones and speakers. Those of you who are on a tight budget yet desire for a great gaming motherboard, this is your ultimate ticket to your extreme gaming experience.